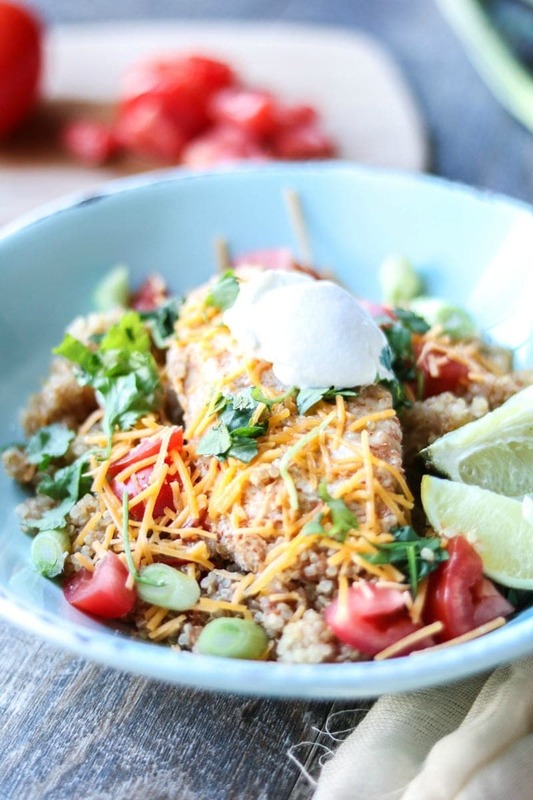 Chicken Quinoa Fajita Bowl: Kitchen staples come together to create protein and nutrient packed one pot wonder tastes just like a chicken fajita, all ready in less than 30 minutes. Gluten-Free with Dairy-Free Options as well. You want to know my secret to healthy, home cooking? It is keeping a well stocked freezer and pantry. 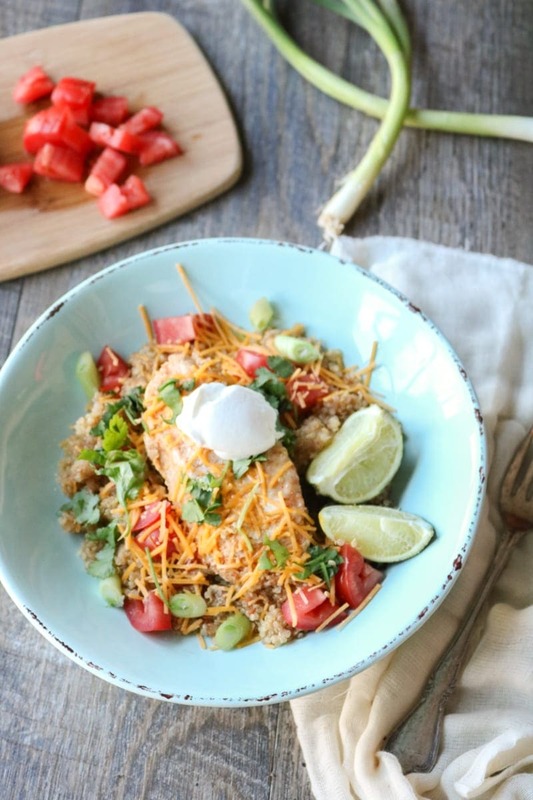 Take this Quinoa Bowl that is filled with the classic flavors of a Chicken Fajita. 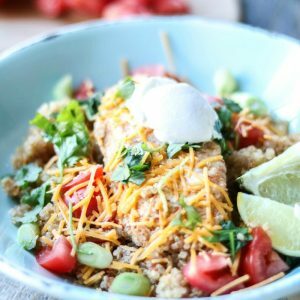 This Chicken Quinoa Bowl comes together in one pan and in less than 30 minutes! And friends, any time I can have a healthy, 30 minute meal on the table, I am one happy lady. And when you add in the fact that this quinoa bowl is made with Mexican flavors–sign me up any night of the week! In a large stock pan, or dutch oven, mix together Homemade Chicken Stock, salsa, frozen peppers and onions, and taco seasoning together. Submerge the chicken breasts in the quinoa mixture. Bring the quinoa mixture to a boil. I love to use chicken stock in for additional flavor in this meal, but you can also use vegetable stock or water. Salsa adds incredible flavor to this recipe, but you can also use Homemade Salsa Verde or a can of diced tomatoes with green chilies. You can use fresh slices of frozen peppers and onions instead of frozen slices. However, frozen peppers and onions are a great money saver! Feel free to add in some cooked beans as well as chicken if desired. Mexican flavors come together perfectly in a quinoa bowl topped with chicken and frozen peppers. Mix together chicken stock, salsa, peppers and onions, seasoning and quinoa together in large stock pan. Add chicken. Bring to a boil. Cover and reduce heat to simmer and cook for 20 minutes, or until quinoa has absorbed most of the liquid and chicken is cooked through. Serve with any of the desired toppings. If cooking in Instant Pot, do not do a Quick Release until at least 10 minutes after cooking time. I don’t know what it is about quinoa bowls that I love so much! 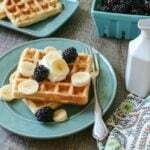 They are so satisfying and filling and can be made with so many different flavors. Mexican is always my favorite way to prepare them. This looks healthy and simple enough to make any night of the week! Karen if quinoa and Mexican are your things–you are going to LOVE these bowls! Totally agree a stocked pantry (and freezer) is the key to making great meals at home. Sure I love the fact that if I lived in Italy I would visit the markets everyday to get fresh ingredients. 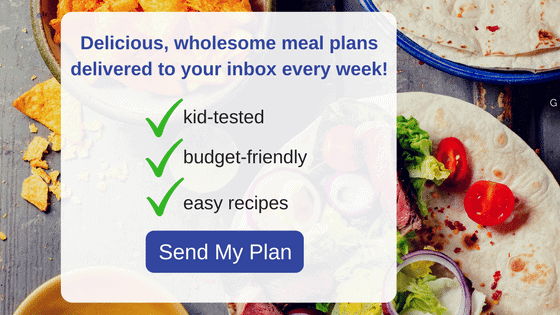 Busy families need nutritious food, not take out. This is a perfect example of how easy it can be…with a little planning of course. What a dream to live next to fresh markets!! I think I would spend probably too much time there! This is absolutely amazing. Looks so healthy and tasty! Such a delicious meal in a bowl, I’m all over this dish, YUM! Can this recipe be doubled in the instant pot? If so, would it be cooked for the same amount of time? Hi Lori! I have not doubled this recipe for the instant pot, but based on other recipes I have successfully doubled, I would increase cooking time to 15 minutes verses the 12. Let me know how it goes if you give it a try! Hi Cheryl!! Yes, after hunting anyone is hungry!!! When you double a recipe in the Instant Pot, you should not need to increase the time. 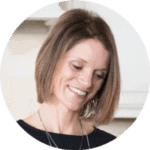 The time to get to pressure may increase slightly, as will the time to release pressure (for this recipe, you want to not do a release of pressure for at least 10 minutes.) Just be sure NOT to exceed your maximum fill time. Enjoy! Can I cook this with FROZEN chicken breasts….? Thank you. If cooking on the stove-top, simmer frozen chicken with stock and seasonings for 15 minutes before adding the quinoa and cooking for an additonal 20 minutes. Are the pepper and onion strips just sliced red peppers and sliced onions or are they seasoned? I am Canadian and not familiar with this product.